Let’s face it. Of all home furnishings, window treatments can be the most intimidating. But they are supposed to be enjoyable, lovely to look at and functional your needs. Face your fear by bringing in the experts. The problem isn’t that window coverings are difficult to select or hard to pay for (somebody had to say it). It’s that most of us don’t know what we like until we see it! Like any other home design, window treatments need to be functional first – darken a room, offer privacy, add warmth and color or filter natural light to brighten the room. Then they need to be decorative. Why? To make you feel good. Simple as that! Our designers can help you sort through a sea of options to find a fashionable, functional solution for your room, your budget and your individual taste. Let us show you our creative abilities. When it comes to window coverings, there is no limit to what we can do. 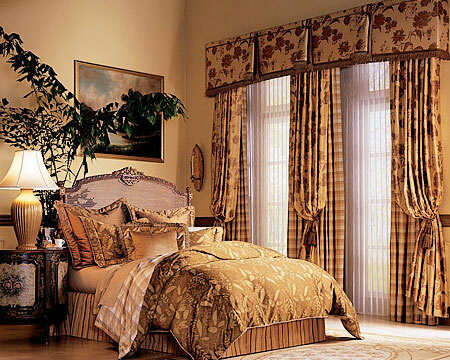 Curtains, blinds, valances, shades, rods and other hardware can create a window to your personality. We’ll come and check out your space, talk about your preferences and create a look and feel that’s distinctly yours.